Tanned and calloused, Floyd Archuleta’s hands tell of decades spent gripping shovels, baling hay and planting seed. On a recent afternoon, his hands turned the steering wheel of a rusty blue truck – his office, he said – as it rumbled along a highway outside Taos, a town of 6,000 in mountainous northern New Mexico. Archuleta pointed to land where his family has farmed alfalfa and raised cattle, pigs and sheep for three generations. Here’s where his parents lived until they died. There, around the corner, stands his brother’s house. These days, the 66-year-old farmer looks across these fields and sees not a promising future, but a troubling thicket of questions. The biggest uncertainty of all: Who’s going to care for the land after Archuleta is gone? Though Archuleta’s family has farmed for hundreds of years, his own children don’t share their parents’ passion for agriculture. His daughters moved to California – one married a surfer – and, though Archuleta had long wished for his only son to someday take over the land, his son died in 2011. Floyd Archuleta opens the headgate on his acequia. Archuleta’s story is not unique in the modern West, where agricultural employment has declined and farming families can often make more money in other industries. The immediate challenge is about economics, of course, but in a region where families pride themselves on cultivating land and protecting historic irrigation systems, those dilemmas are also anchored in culture and history. The question, “What to do with my land?” lies at the complicated intersection of past and future. Farmers aren’t the only people struggling with what comes next. Many small communities across the Mountain West are confronting complex challenges. How to grow a robust economy and create good jobs without sacrificing the qualities that make a place special? How to navigate competing claims on quality of life, so towns don’t become just weekend playgrounds for the wealthy? How to foster happy, healthy families in rural areas plagued by entrenched poverty? The solutions will inevitably be different in eclectic Taos, with its mix of modern outfitters and families like Archuleta’s, than in Saguache, Colorado – a town of 500 at the northern end of Colorado’s San Luis Valley. But while the answers may vary, the questions are strikingly similar. Over the next six months, seven newsrooms in New Mexico and Colorado will explore urgent challenges to the vitality of Western communities. The project, called “Small Towns, Big Change,” will produce stories that not only examine problems, but also surface and assess emerging responses to those issues. We hope to catalyze discussion about what works, what doesn’t, and how people, institutions, and communities might change things. The future of small towns is about more than pretty mountains and quiet streets. Many rural communities confront the same problems as everywhere else – but without resources to solve them. On a May afternoon, the headquarters of Inside Out Recovery, a tiny office tucked between a church and a tattoo parlor in Española, New Mexico, buzzed with activity. A crowd huddled around the doorway waiting to write down their names at the front desk, which was overseen by a neatly bearded man named Josh Trujillo. Trujillo, 28, understands the deep-rooted economic, cultural and geographic forces that lead to drug abuse in Espanola, a town of 10,000 where heroin overdose rates have long been among the nation’s highest. As a teenager seeking emotional escape, Trujillo turned from weed, to drinking, to pills, and eventually to heroin. A friend’s grandmother showed him how to grind Oxycodone tablets and snort the powder to get high. In high school, his parents divorced. His mom moved to Colorado, leaving Trujillo with his dad, who gave Trujillo a job in his welding shop, paid cash wages, and didn’t ask questions. Trujillo stole from his family and friends to support what was, at its worst, a $600-per-day habit. A decade into Trujillo’s addiction, a family friend introduced him to a man who worked for Inside Out, and they started meeting one-on-one. Before being released from his last stint in jail, Trujillo called the Inside Out worker, who asked where Trujillo usually went when he got out. Straight to the dope man, Trujillo told him. Come straight to Inside Out instead, the man said. Four years later, Trujillo is a certified peer support worker at Inside Out, a free wellness center where every staff member is recovering from addiction. Last year alone, Trujillo said, nearly 1,700 clients walked through the center’s doors – more than 4 percent of the county’s population. Today, Trujillo is married with a 7-month-old son, who teaches him what his own parents experienced during Trujillo’s toughest years. Many of the difficulties facing Western towns are rooted in economic reality: good jobs can be scarce, and businesses often struggle. To see a different angle on hardship, look no further than the Fourth Street Diner in Saguache, Colorado, where most days, you can find 60-year-old Esther Last baking pies or stoking the diner’s wood stove. Old men in cowboy hats rub elbows with tourists driving between Durango and Denver. Though summers keep Last’s diner afloat, slow winter months threaten to sink it. 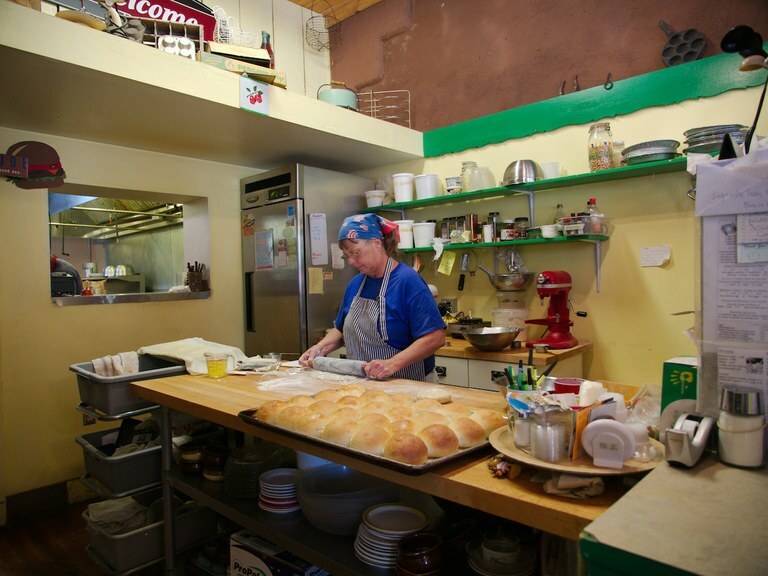 Esther Last bakes at the diner she owns in Saguache, Colorado. Lately, her business has struggled to pay its property taxes. Between mortgage payments, a nine-person payroll, electricity bills and insurance, little has been left for taxes. As of April, Last owed the state nearly $14,000. Friends, family and customers raised $5,000 through an online fundraiser, and the diner scraped together the rest. Despite her diner’s troubles, Last, a transplant from Michigan who moved to Colorado in the 1970s, wouldn’t trade her life in Saguache. Today, the diner is for sale, and Last likely faces more tax bills. 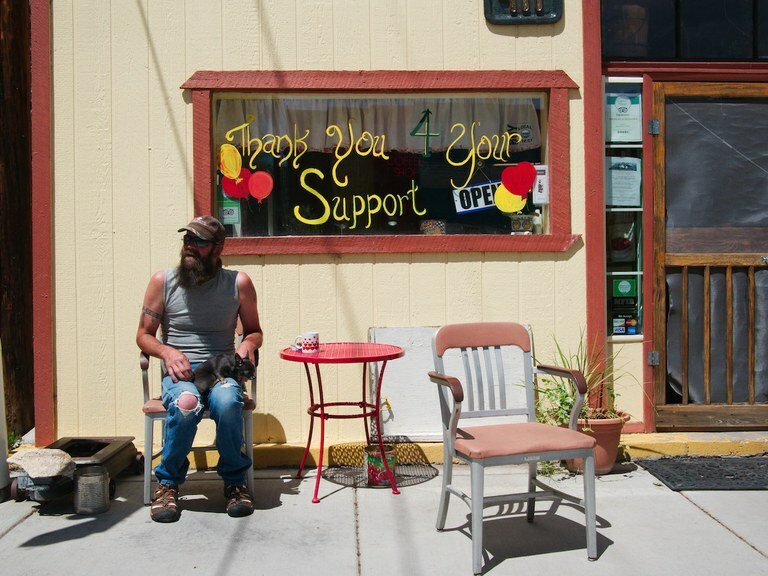 Yet she loves the town for the same reasons her business struggles: the scant workforce, the slow trickle of tourists, Saguache’s remote location. Troy Wright, of Saguache, Colorado, sits outside the Fourth Street Diner in Saguache with his 2-year-old Chihuahua, Gator, on May 20, 2016. An online campaign started by the owner's friends and family recently raised $5,000 to help the struggling diner pay its overdue tax bills. Rural communities today encounter a web of problems. Economic questions often boil down to cultural ties; environmental solutions are limited by financial realities; community health is inseparable from employment opportunities. Archuleta, the farmer still working his family’s land outside Taos, hopes to have 30 more years in him. His father irrigated these fields until age 97, staving off bids from prospectors who wanted to subdivide his land. Though his father never sold a square inch, Archuleta knows a decision is now just a matter of time. His best advice so far, he said, came from his 14-year-old grandson. “Do you think we should sell the land, or keep it?” Archuleta asked the boy not long ago. “That’s the best answer that I got."